Fill a large pitcher with ice. Add the juice and sparkling water or ginger ale. Toss in the fruit slices. Store in the fridge until ready to serve, or serve immediately. Keep the drinks flowing with these non-alcoholic drinks the whole family will love. 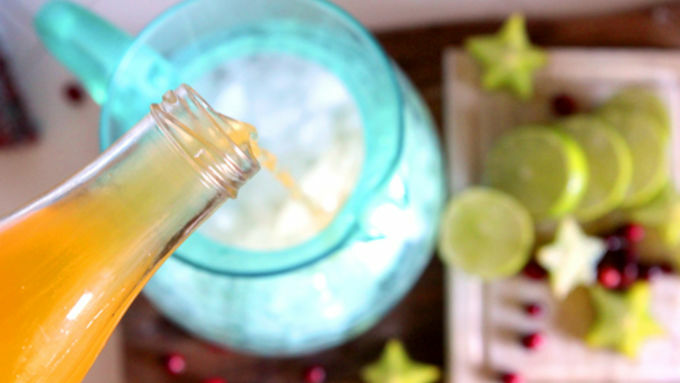 Pull out the holiday drinks and host a toast that everyone can enjoy with this non-alcoholic Festive Family Sangria made with passion fruit juice! When it's time to break out the celebratory spirit, there's nothing quite so perfect as a nice mixed drink like sangria -- typically a blend of sweetened red wine, citrus juice, soda water and fresh seasonal fruits. But when you're mixing and mingling with kids of all ages, it's a game changer that calls for a different kind of drink. 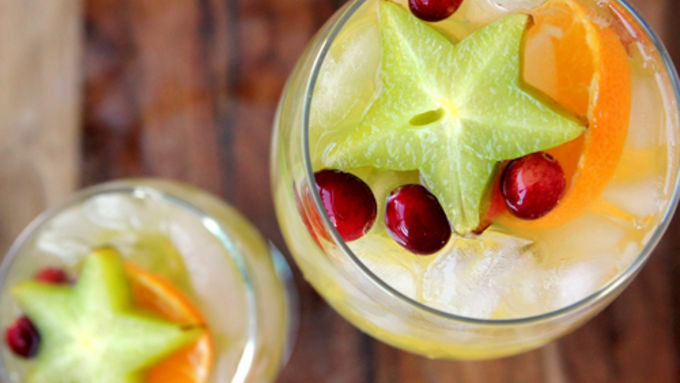 This non-alcoholic Festive Family Sangria is just sweet enough to appeal to the flavor palates of the younger set, but it's pretty enough to serve to adults at a party. And it's more fun to serve than Shirley Temples! Here's how to get yourself a pitcher of this splendid punch. This recipe couldn't be a snip easier to pull together! Just slice yourself some fruits (we used limes, oranges, starfruit, and fresh cranberries), then pour a bit of Passion Fruit juice and sparkling water or gingerale in a pitcher. That's it! So simple, so fresh, so totally worth a cheers! You can serve the sangria right away, or pop it into the fridge for a couple of hours to let the flavors of the fruits meld into the juice. It's totally up to you! 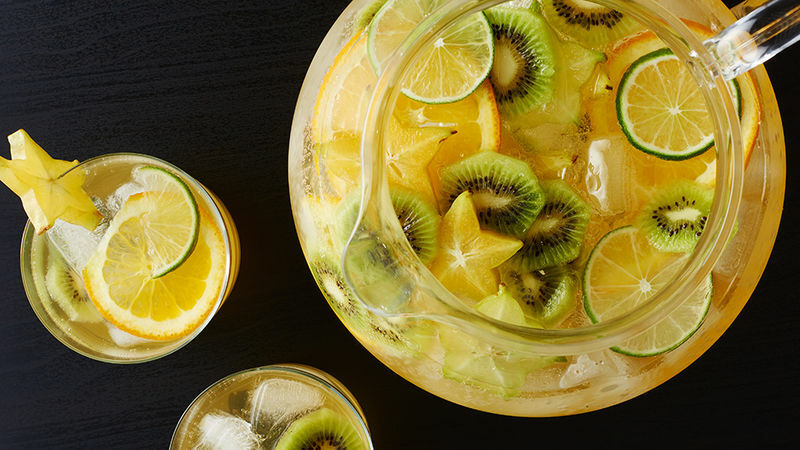 To make this Passion Fruit Sangria an alcoholic toddy for just the grown-ups, add a cup or more of your favorite sweet white wine to the beverage, then allow the pitcher to rest for an hour so the wine can mingle with all the flavors of the juices and fruits. Whether you go with the family-friendly version, or adults-only cocktail, we offer up a toast for wealth, health, and lots of happiness to you and yours!